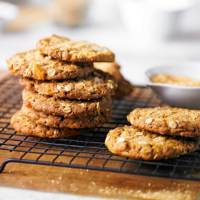 Light brown muscovado sugar is the secret ingredient here, giving the cookies irresistibly chewy middles and crisp edges. 1. Preheat the oven to 190°C, gas mark 5. Line two baking sheets with baking parchment. Cream the butter and muscovado sugarin a bowl using electric beaters, then beat in the egg yolk. 2. Sift in the flour, salt and ground ginger. Using a spatula, work together to make a soft dough. Fold in 100g oats and 2/3 the stem ginger. 3. Mix the remaining oats and stem ginger with the demerara. Shape 1 level tbsp dough into a ball, press into the oat mix, then transfer to the baking sheets, oaty-side up. Repeat; leave room for spreading. 4. Bake for 10 minutes. Cool on the trays for 5 minutes, then transfer to a wire rack to cool completely. Store in an airtight tin. This recipe was first published in Wed Aug 12 11:18:00 BST 2015.